Young Edsel Ford didn’t have the marketplace for station wagons all to himself, when Ford produced their first factory-offered station wagon in 1929. The body building industry had been hard at work delivering wagon bodies, since the first piston-powered depot hack rolled towards the local railway depot delivering passengers and freight back at the turn of the century. It was hardy pioneering body builders like a Mifflinburg, Geneva Body Co., Springfield, Parry and Hercules who lead the way, years ahead of young Edsel. 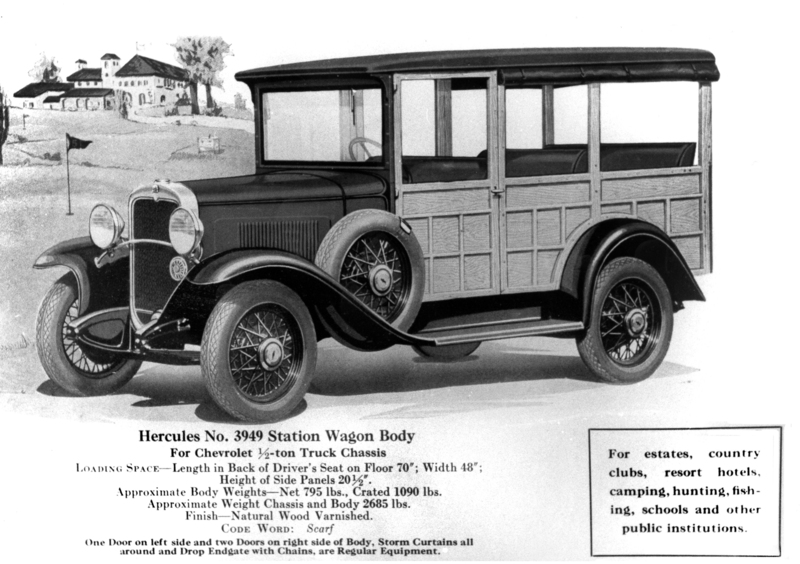 As you can see from this tear sheet ad from the 1929 body builder book, Hercules were offering a very complete and substantial Chevrolet station wagon body conversion contradicting what Ford projected as an all-new idea. Hercules sales’ focus was not family transportation, but rather country clubs, estates, schools and public institutions. Built on a 1/2 ton Chevrolet truck chassis, the body featured only one door on the driver’s side and two on the other. Roll-up storm curtains were standard, as was a tailgate with supporting chains. It is also interesting to note that Hercules shipped these bodies to individual dealers for installation. This made ordering simple and saved on freight cost, as the body unit weighed 795 pounds – crating adding 300 pounds. Parked side-by-side with a Model-A, this Chevrolet only looked different because of its proportion. How many were built and how many survived? We don’t know. It is surprising that these were not more popular as Chevrolet offered a new six-cylinder OHV engine in 1929 in the half ton chassis, with a huge variety of different bodies from stake-side trucks, to Traveler’s Broughams, to 14-passenger touring bus bodies. It was the dawn of a new age in automotive design; everything was about to get better. It’s a pity the Great Depression killed off so much brilliant manufacturing and design, but interestingly, Ford and Hercules survived and so did Chevrolet. ← Pigeon Service Woody Wagons!